During mango season, instead of serving the raw fruit, you may try out one of the dessert recipes. Mango and vanilla custard make a wonderful combination. 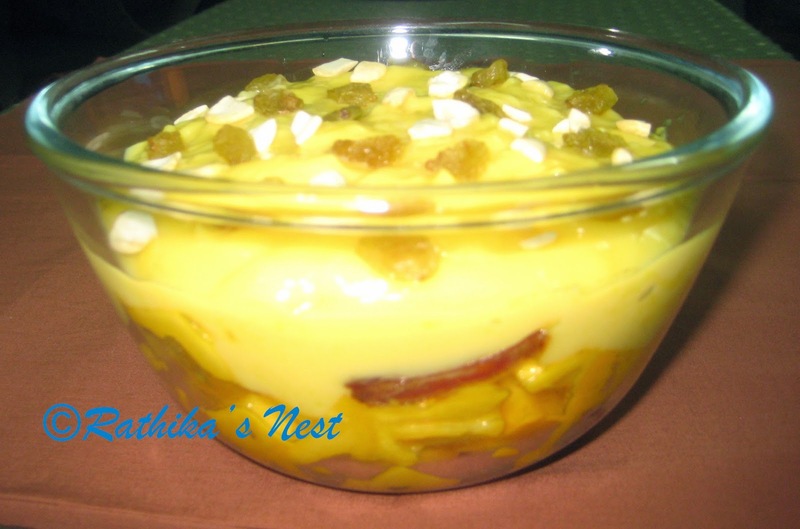 This recipe combines mango, dates and nuts with custard. Children will simply love this dessert! Here is the recipe. Note: I have used 'Banganapalli' mango (பங்கனபள்ளி மாம்பழம்) for this recipe. However, you may use any variety of mango. Method: Wash and peel the mango and cut the flesh into cubes. Cut date into thin length-wise strips. Mix custard powder in milk thoroughly without lumps. Add in sugar. Heat the mixture on low flame stirring continuously till it thickens. Remove custard from fire and allow it to cool. Mix mango and date pieces in a bowl. Pour the custard on top. Decorate with cashew nuts and raisins. Keep the dessert in the cooler compartment of the refrigerator for 30 minutes -1 hour. Serve chilled.